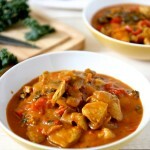 This African Groundnut Stew is super easy to make and is absolutely full of flavor. It will rock your world, oh yes it will! In a saute pan over medium heat, saute chicken in a tablespoon or two of butter until juices run clear and is done, about 10 minutes (this time varies depending on how big your chicken chunks are). Set aside to cool. In a 6 qt sauce pan, over medium heat add one tbsp butter and melt. Stir in onions, celery, and the red pepper. Cook until onions are translucent and soft about 7 minutes. Add garlic, curry powder and ginger and stir for about 1 minute. Do not over cook the garlic, it should not get brown. Add tomato sauce and bay leaf and kale and cook for 3-4 minutes. Add broth and chicken and stir well and bring to a boil. Reduce to a simmer and add in the peanut/almond butter and stir well. Heat through for a minute or two and stir in the cilantro. Season with salt and pepper if needed and serve immediately.